Simon & Schuster, 9780684853260, 224pp. Cajun, Creole, and Caribbean dishes all have their roots in the cooking of West and Central Africa; the peanuts, sweet potatoes, rice, cassava, plantains, and chile pepper that star in the cuisines of New Orleans, Puerto Rico, and Brazil are as important in the Old World as they are in the New World. 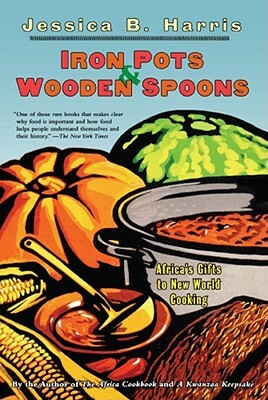 In Iron Pots and Wooden Spoons, esteemed culinary historian and cookbook author Jessica Harris returns to the source to trace the ways in which African food has migrated to the New World and transformed the way we eat. From condiments to desserts, Harris shares more than 175 recipes that find their roots and ingredients in Africa, from Sand-roasted Peanuts to Curried Coconut Soup, from Pepper Rum to Candied Sweet Potatoes, from Beaten Biscuits to Jamaica Chicken Run Down, from Shortening Bread to Ti-Punch. Enticing recipes, a colorful introduction on the evolution of transported African food, information on ingredients from achiote to z'oiseaux and utensils make this culinary journey a tantalizing, and satisfying, experience.